The vegetation of Salou is typically Mediterranean. 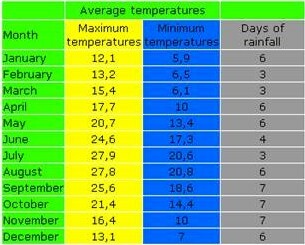 The climate is characterized by mild temperatures throughout the year with moderate heat or cold, depending on the time of the year. There is a wide variety of plant life around the town. Salou has always taken an interest in protecting its native species, while transplanting others that fit in with the local environment. For example, in the Cape of Salou area we find the plants and flowers native to the area, while the gardens and other areas in which man has had a hand, the display of trees and plants is considerably more varied. One such area is the Jaume I Promenade where the variety of flowers and colours and the impressive palm trees have made it into the emblem of the resort.